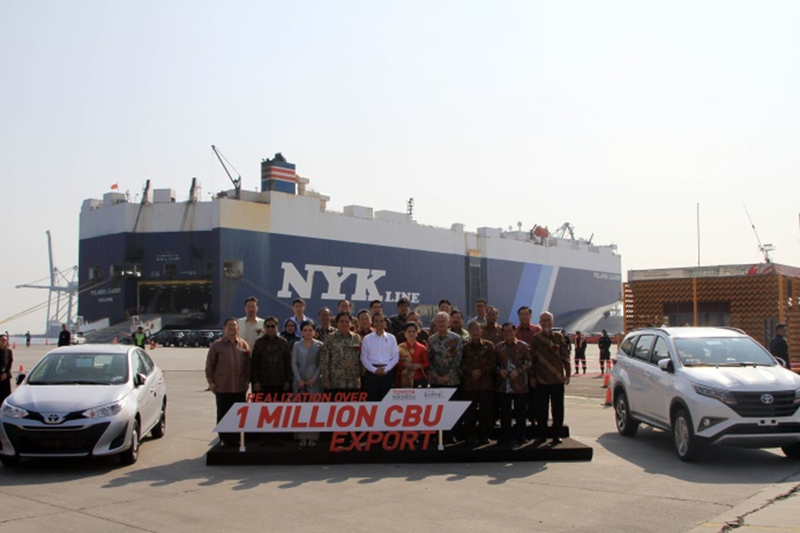 Jakarta - Toyota Indonesia celebrates its achievement in export activity that take place for more than 30 years by conducting the “1 Million Unit CBU Export Realization” ceremony, on the 5th of September 2018, at Tanjung Priok Car Terminal. This Export Ceremony is a celebration of the achievement of Toyota vehicle export volume that had reached a total number of more than 1 million units, since the prime export activity. Furthermore, this ceremony serves as a sign of realization commitment made by President of Toyota Motor Corporation Akio Toyoda, to the President of the Republic of Indonesia Joko Widodo, in Aichi-Japan, which is the improvement of Toyota investment and export activity in Indonesia. Toyota Indonesia exports variety of automotive products such as whole vehicle (Complete Built-up Unit / CBU), ravel vehicle (Complete Knock Down / CKD), whole engine machine type TR and NR, vehicle components, and also aiding machine in the form of jig (welding machine). As for whole vehicle, there are 9 models that are exported by Toyota Indonesia to foreign countries such as Fortuner, Kijang Innova, Vios, Yaris, Sienta,Avanza, Rush, Agya, dan Townace/Townlite, with the Fortuner model as a Sport Utility Vehicle (SUV) model with the largest amount of export volume with a cumulative amount of 410.000 unit. In the year 2017, the total amount of export volume of Toyota managed to achieve the largest number of unit throughout the export activity in Indonesia, that is 199.000 units per year. The consistency of Toyota Indonesia in conducting export activity had succeed in getting the approval from the Indonesia government through achieving the Primaniyarta Award “Performing Exporter” category 8 times from the year 2008, 2010, 2011, and continuously from the year 2013 until 2017. In the future times, Toyota Indonesia commits to work together with interest parties to support the improvement of upstream, middle, and lower industry, so that it can enhance the structure and competitiveness of automotive industry in Indonesia, which results in improving the chance of automotive export in Indonesia.